(Francisco Kjolseth | The Salt Lake Tribune) Oklahoma City Thunder forward Nerlens Noel (3) stays in front of Utah Jazz guard Dante Exum (11) in the NBA game at Vivint Smart Home Arena Sat., Dec. 22, 2018, in Salt Lake City. 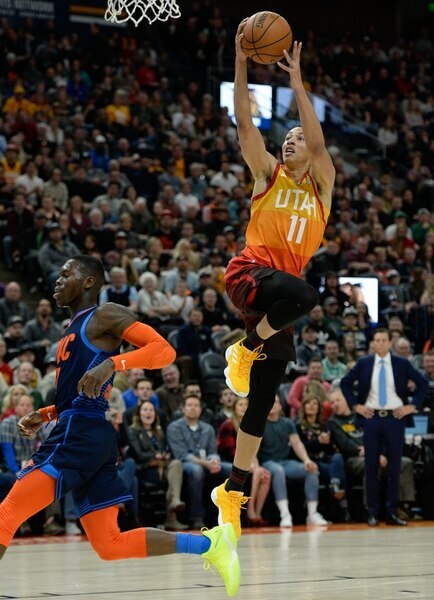 (Francisco Kjolseth | The Salt Lake Tribune) Utah Jazz guard Dante Exum (11) lays one up past the Thunder in the NBA game at Vivint Smart Home Arena Sat., Dec. 22, 2018, in Salt Lake City. 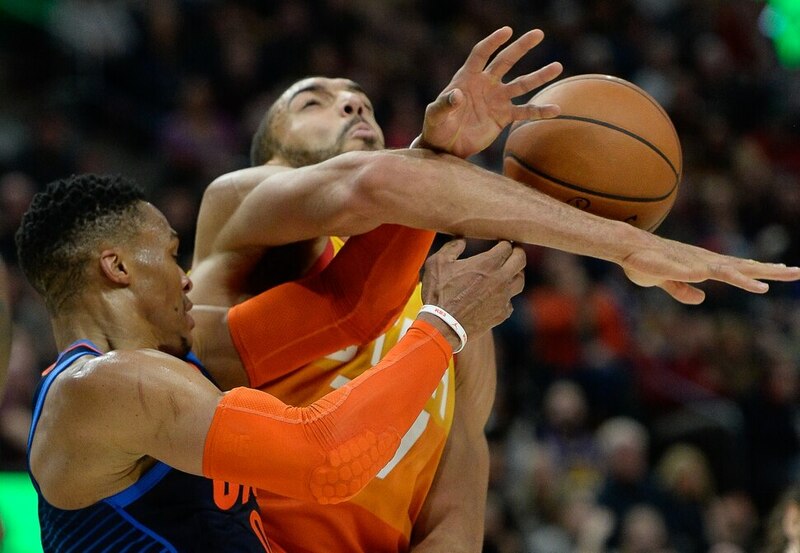 (Francisco Kjolseth | The Salt Lake Tribune) Oklahoma City Thunder guard Russell Westbrook (0) puts the pressure on Utah Jazz center Rudy Gobert (27) in the NBA game at Vivint Smart Home Arena Sat., Dec. 22, 2018, in Salt Lake City. (Francisco Kjolseth | The Salt Lake Tribune) Oklahoma City Thunder guard Russell Westbrook (0) keeps his eye on the Jazz in the NBA game at Vivint Smart Home Arena Sat., Dec. 22, 2018, in Salt Lake City. (Francisco Kjolseth | The Salt Lake Tribune) Oklahoma City Thunder forward Paul George (13) pressures Utah Jazz guard Dante Exum (11) in the NBA game at Vivint Smart Home Arena Sat., Dec. 22, 2018, in Salt Lake City. (Francisco Kjolseth | The Salt Lake Tribune) Utah Jazz forward Joe Ingles (2) flies into the stands as he battles for a loose ball against Oklahoma City Thunder guard Russell Westbrook (0) in the NBA game at Vivint Smart Home Arena Sat., Dec. 22, 2018, in Salt Lake City. (Francisco Kjolseth | The Salt Lake Tribune) Oklahoma City Thunder guard Alex Abrines (8) pressures Utah Jazz guard Dante Exum (11) in the NBA game at Vivint Smart Home Arena Sat., Dec. 22, 2018, in Salt Lake City. (Francisco Kjolseth | The Salt Lake Tribune) Utah Jazz guard Donovan Mitchell (45) pushes past Oklahoma City Thunder guard Terrance Ferguson (23) as he battles the Thunder in the NBA game at Vivint Smart Home Arena Sat., Dec. 22, 2018, in Salt Lake City. (Francisco Kjolseth | The Salt Lake Tribune) Utah Jazz forward Royce O'Neale (23) tries to block Oklahoma City Thunder forward Paul George (13) in the NBA game at Vivint Smart Home Arena Sat., Dec. 22, 2018, in Salt Lake City. (Francisco Kjolseth | The Salt Lake Tribune) Utah Jazz forward Joe Ingles (2) argues with Oklahoma City Thunder guard Russell Westbrook (0) in the NBA game at Vivint Smart Home Arena Sat., Dec. 22, 2018, in Salt Lake City. (Francisco Kjolseth | The Salt Lake Tribune) \Utah Jazz center Rudy Gobert (27) loses control of the ball as he's pressured by the Thunder in the NBA game at Vivint Smart Home Arena Sat., Dec. 22, 2018, in Salt Lake City. (Francisco Kjolseth | The Salt Lake Tribune) Utah Jazz forward Joe Ingles (2) argues with Utah Jazz center Rudy Gobert (27) in the NBA game at Vivint Smart Home Arena Sat., Dec. 22, 2018, in Salt Lake City. (Francisco Kjolseth | The Salt Lake Tribune) Utah Jazz guard Ricky Rubio (3) pushes past Oklahoma City Thunder guard Russell Westbrook (0) in the NBA game at Vivint Smart Home Arena Sat., Dec. 22, 2018, in Salt Lake City. (Francisco Kjolseth | The Salt Lake Tribune) Oklahoma City Thunder center Steven Adams (12) puts the block on Utah Jazz guard Donovan Mitchell (45) in the NBA game at Vivint Smart Home Arena Sat., Dec. 22, 2018, in Salt Lake City. (Francisco Kjolseth | The Salt Lake Tribune) Oklahoma City Thunder center Steven Adams (12) puts the block on Utah Jazz center Rudy Gobert (27) during a free throw in the NBA game at Vivint Smart Home Arena Sat., Dec. 22, 2018, in Salt Lake City. (Francisco Kjolseth | The Salt Lake Tribune) Utah Jazz guard Donovan Mitchell (45) keeps his eye on the basket as he battles the Thunder in the NBA game at Vivint Smart Home Arena Sat., Dec. 22, 2018, in Salt Lake City. (Francisco Kjolseth | The Salt Lake Tribune) Utah Jazz center Rudy Gobert (27) sinks one in over the Thunder in the NBA game at Vivint Smart Home Arena Sat., Dec. 22, 2018, in Salt Lake City. (Francisco Kjolseth | The Salt Lake Tribune) Utah Jazz guard Dante Exum (11) reaches back on an attempt past the Thunder in the NBA game at Vivint Smart Home Arena Sat., Dec. 22, 2018, in Salt Lake City. (Francisco Kjolseth | The Salt Lake Tribune) Utah Jazz center Rudy Gobert (27) battles Oklahoma City Thunder forward Jerami Grant (9) in the NBA game at Vivint Smart Home Arena Sat., Dec. 22, 2018, in Salt Lake City. (Francisco Kjolseth | The Salt Lake Tribune) Utah Jazz guard Dante Exum (11) tries to move past the Thunder defense in the NBA game at Vivint Smart Home Arena Sat., Dec. 22, 2018, in Salt Lake City. (Francisco Kjolseth | The Salt Lake Tribune) Utah Jazz center Rudy Gobert (27) tries to drop one in past Oklahoma City Thunder guard Alex Abrines (8) in the NBA game at Vivint Smart Home Arena Sat., Dec. 22, 2018, in Salt Lake City. (Francisco Kjolseth | The Salt Lake Tribune) Utah Jazz head coach Quin Snyde yells out to his team as they take on the Thunder in the NBA game at Vivint Smart Home Arena Sat., Dec. 22, 2018, in Salt Lake City. (Francisco Kjolseth | The Salt Lake Tribune) Oklahoma City Thunder forward Patrick Patterson (54) pressures Utah Jazz forward Derrick Favors (15) in the NBA game at Vivint Smart Home Arena Sat., Dec. 22, 2018, in Salt Lake City. (Francisco Kjolseth | The Salt Lake Tribune) Utah Jazz center Rudy Gobert (27) slams one in past the Thunder in the NBA game at Vivint Smart Home Arena Sat., Dec. 22, 2018, in Salt Lake City. (Francisco Kjolseth | The Salt Lake Tribune) Utah Jazz guard Donovan Mitchell (45) keeps his eye on the basket as he battles Oklahoma City Thunder forward Paul George (13) and Oklahoma City Thunder center Steven Adams (12) in the NBA game at Vivint Smart Home Arena Sat., Dec. 22, 2018, in Salt Lake City. (Francisco Kjolseth | The Salt Lake Tribune) Utah Jazz center Rudy Gobert (27) is pressured by Oklahoma City Thunder center Steven Adams (12) and Oklahoma City Thunder guard Terrance Ferguson (23) in the NBA game at Vivint Smart Home Arena Sat., Dec. 22, 2018, in Salt Lake City. (Francisco Kjolseth | The Salt Lake Tribune) Utah Jazz guard Donovan Mitchell (45) slides off the court against the Thunder in the NBA game at Vivint Smart Home Arena Sat., Dec. 22, 2018, in Salt Lake City. (Francisco Kjolseth | The Salt Lake Tribune) Utah Jazz guard Donovan Mitchell (45) gains control of a rebound in the final seconds of the game as Utah Jazz center Rudy Gobert (27) and Utah Jazz guard Ricky Rubio (3) try to assist with Oklahoma City Thunder center Steven Adams (12) putting on the pressure in the second half of the NBA game at Vivint Smart Home Arena Sat., Dec. 22, 2018, in Salt Lake City. (Francisco Kjolseth | The Salt Lake Tribune) Utah Jazz guard Donovan Mitchell (45) misses his first of two free throws with 1.5 seconds remaining and down 107 to 105 in the second half of the NBA game at Vivint Smart Home Arena Sat., Dec. 22, 2018, in Salt Lake City. (Francisco Kjolseth | The Salt Lake Tribune) Utah Jazz guard Donovan Mitchell (45) passes to an open teammate as they battle the Thunder in the second half of the NBA game at Vivint Smart Home Arena Sat., Dec. 22, 2018, in Salt Lake City. (Francisco Kjolseth | The Salt Lake Tribune) Utah Jazz forward Thabo Sefolosha (22) flies into the stands in pursuit of a ball agains the Thunder in the second half of the NBA game at Vivint Smart Home Arena Sat., Dec. 22, 2018, in Salt Lake City. (Francisco Kjolseth | The Salt Lake Tribune) Oklahoma City Thunder forward Jerami Grant (9) battles Utah Jazz center Rudy Gobert (27) in the second half of the NBA game at Vivint Smart Home Arena Sat., Dec. 22, 2018, in Salt Lake City. (Francisco Kjolseth | The Salt Lake Tribune) Utah Jazz head coach Quin Snyder argues a call alongside Utah Jazz guard Donovan Mitchell (45) in the second half of the NBA game at Vivint Smart Home Arena Sat., Dec. 22, 2018, in Salt Lake City. (Francisco Kjolseth | The Salt Lake Tribune) Utah Jazz head coach Quin Snyder talks with Utah Jazz guard Ricky Rubio (3) during their game agains the Thunder in the second half of the NBA game at Vivint Smart Home Arena Sat., Dec. 22, 2018, in Salt Lake City. (Francisco Kjolseth | The Salt Lake Tribune) Oklahoma City Thunder center Steven Adams (12) tries to steal the ball from Utah Jazz guard Donovan Mitchell (45) as he calls for a time out in the final seconds in the second half of the NBA game at Vivint Smart Home Arena Sat., Dec. 22, 2018, in Salt Lake City. (Francisco Kjolseth | The Salt Lake Tribune) Oklahoma City Thunder guard Russell Westbrook moves past Utah Jazz guard Ricky Rubio (3) in the second half of the NBA game at Vivint Smart Home Arena Sat., Dec. 22, 2018, in Salt Lake City. (Francisco Kjolseth | The Salt Lake Tribune) Utah Jazz forward Derrick Favors (15) takes a hard hit from Oklahoma City Thunder forward Nerlens Noel (3) in the second half of the NBA game at Vivint Smart Home Arena Sat., Dec. 22, 2018, in Salt Lake City. (Francisco Kjolseth | The Salt Lake Tribune) Utah Jazz guard Ricky Rubio (3) finds himself in the crowd chasing down a ball against the Thunder in the second half of the NBA game at Vivint Smart Home Arena Sat., Dec. 22, 2018, in Salt Lake City. (Francisco Kjolseth | The Salt Lake Tribune) Utah Jazz guard Donovan Mitchell (45) finds himself surrounded by the Thunder defense in the second half of the NBA game at Vivint Smart Home Arena Sat., Dec. 22, 2018, in Salt Lake City. (Francisco Kjolseth | The Salt Lake Tribune) Utah Jazz head coach Quin Snyder argues a call during their game against the Thunder in the second half of the NBA game at Vivint Smart Home Arena Sat., Dec. 22, 2018, in Salt Lake City. (Francisco Kjolseth | The Salt Lake Tribune) Utah Jazz fan Sammie Worthen watches as the team warms up before their game against the Thunder in the NBA game at Vivint Smart Home Arena Sat., Dec. 22, 2018, in Salt Lake City. (Francisco Kjolseth | The Salt Lake Tribune) The crowd gets pumped up as the Utah Jazz are introduced before the start of their game agains the Thunder in the NBA game at Vivint Smart Home Arena Sat., Dec. 22, 2018, in Salt Lake City. Maybe the Jazz’s legs started to go, considering it was the second night of a back-to-back and their third game in four nights. Or maybe shots simply didn’t fall at the worst possible time. Either way, it proved costly. 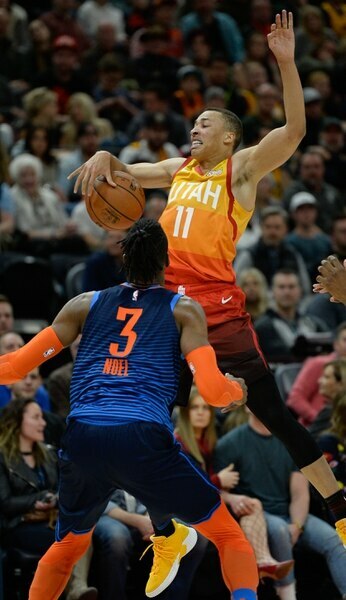 A dry spell for Utah’s offense, a blistering, MVP-level performance from Paul George, and some bad breaks down the stretch Saturday night at Vivint Smart Home Arena resulted in a 107-106 Thunder win, bringing a gut-wrenching end to Utah’s nascent two-game winning streak. “If we were fatigued, I think we did a good job of playing through it. And you would expect a little bit of that on a back-to-back. But I don’t think our team was thinking about that,” said coach Quin Snyder. “We were able to raise our level later in the game on the defensive end and make some plays there. We just had a couple of things that didn’t go our way on the offensive end. It was tough. After leading for most of the game, thanks to a strong start from Derrick Favors, another beautiful display of court vision from Ricky Rubio, and an aggressive offensive effort from Donovan Mitchell, things started going south midway through the third period. Inside shots started rattling in and out. Then, the open looks for 3 started coming up short. George took advantage, hitting one impossible shot after another to total 22 points individually in the period, and helping OKC close the quarter on a 23-2 run that turned a 79-70 deficit into a 93-81 advantage going into the final 12 minutes. Utah kept clawing back, though. They narrowed the deficit, constantly poised to regain momentum. But then a wide-open Royce O’Neale 3-pointer missed … an open Mitchell 3-pointer missed … another good look by O’Neale at a trey missed. And a home crowd ready to burst at a dagger shot instead groaned with each good look that clanked off the rim. They still had a few chances in the game’s final seconds. After getting all the way back to within 107-105, the Jazz gained possession of the ball with 7 seconds left. Mitchell shook off George on the perimeter, rose for a one-handed dunk attempt, and was hacked by Russell Westbrook — the Thunder star’s sixth foul — with 1.5 seconds left. And the first free-throw attempt rolled out. To compound the issue, Mitchell attempted to miss his second attempt, but accidentally made it. The Thunder quickly inbounded, evaded the Jazz defenders, then tossed the ball ahead to run out the clock. It was a disappointing finish to an overall strong effort. Rudy Gobert had 20 points and 10 rebounds. Rubio continued his stellar run of play, totaling 12 points and dishing out 14 heady assists. Favors added 16 points, and Joe Ingles chipped in 13. None of which could compare to George, who delivered a game-wrecking effort on both sides of the ball, totaling 43 points, 14 rebounds, six assists and five steals. Still, while the Jazz missed out on a chance to bring a three-game winning streak into their Christmas night game against the Trail Blazers, they nevertheless saw some silver linings in the loss. “The takeaway on the positive side of the ledger is how we defended in the fourth quarter. I thought our defense improved,” Snyder said. “… Our guys, they competed — I thought we did a better job of attacking them.